Dame Glenys Stacey is stepping down as HM chief inspector of probation for England and Wales at the end of May. She looks back at nearly 40 years in public service. Dame Glenys Stacey is stepping down as HM Chief Inspector of Probation for England and Wales at the end of May. In her last annual report she was deeply critical of the Probation services saying that privatising offender management was "irredeemably flawed". She looks back at nearly forty years in public service. Premenstrual Dysphoric Disorder (PMDD) is a condition which can lead to severe depression, anxiety and personality change, leaving sufferers feeling suicidal and desperate every month. It is sometimes mis-diagnosed as mental ill health and is estimated to affect 5% of menstruating women. Paula Briggs, a consultant in Reproductive and Sexual health is leading a study looking a new treatments for PMDD. Fifty years ago today (17th April)) a 21-year-old woman from Northern Ireland, Bernadette Devlin, became Britain's youngest ever female MP and the third youngest MP ever when she was elected to Westminster in a by-election in the Mid-Ulster constituency. Historian, Dr Margaret Ward explains why her election was a seismic event at the time. 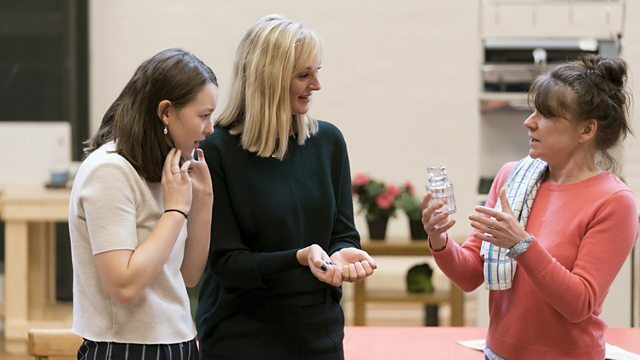 Top Girls, the iconic feminist play by Caryl Churchill is currently on stage at the National Theatre in London. Three actors from the cast join Jenni to discuss why the play made such an impact when it was first performed in 1982 and how relevant it is today.